This week’s fossils were found on a most excellent field trip to the Niagara region of New York in August. One of our outcrops was a small patch of gravel in Bethany Center where the Centerfield Limestone Member of the Ludlowville Formation (Givetian, Middle Devonian) was exposed. My colleagues and I found many interesting fossils here. The largest specimen I collected was the above rugose coral. It is Heliophyllum halli Milne-Edwards and Haime, 1850. 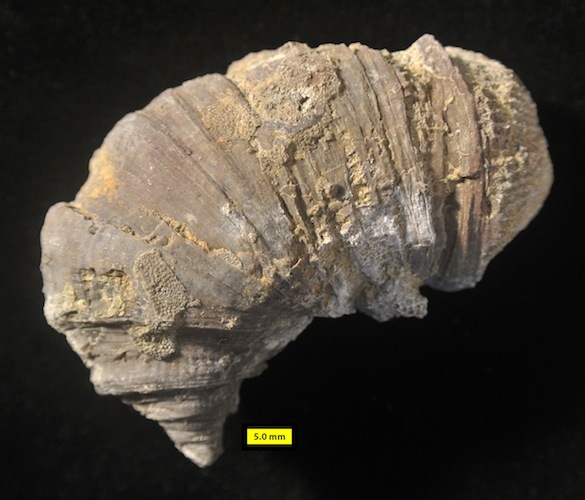 This species is very common throughout the Devonian Hamilton Group of New York, Ontario and surrounding areas. The 90-degree bend in the specimen is a result of the living coral being knocked over onto its side and then twisting to grow upwards again. These corals are called “rugose” because of their “wrinkled” exteriors, easily seen in this view. The solitary forms, like this one, are a single corallite that held one polyp in life. Their conical growth form gives them another nickname: “horn corals”. Rugose corals also come in colonial varieties, which we’ve covered before in this blog. Their skeletons are made of thick calcite, so they are almost always well preserved. These corals are distinguished from others by their strong internal vertical walls (septa) and relatively few horizontal or angled partitions (tabulae and dissepiments). They lived like most other corals as sessile benthic (stationary on the bottom) predators catching food with their tentacles. It is still uncertain whether they had photosynthetic symbionts (zooxanthellae) like modern corals. Emily Damstra has a nice reconstruction of living Heliophyllum halli. This particular coral has a collection of encrusting organisms on its exterior. 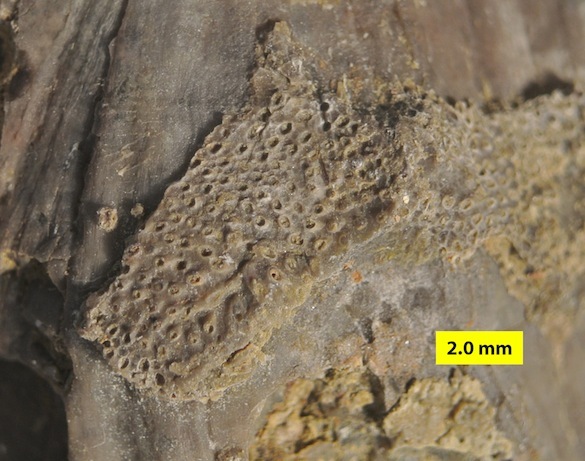 Above is a remnant of a bryozoan. 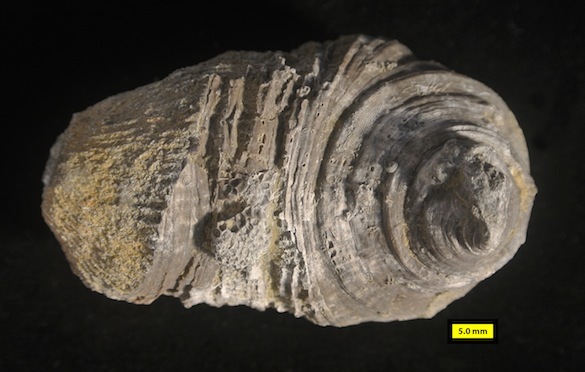 The encrusting coiled shell in the lower left is a nice microconchid (a mysterious lophophorate) and at the top is another type of bryozoan. 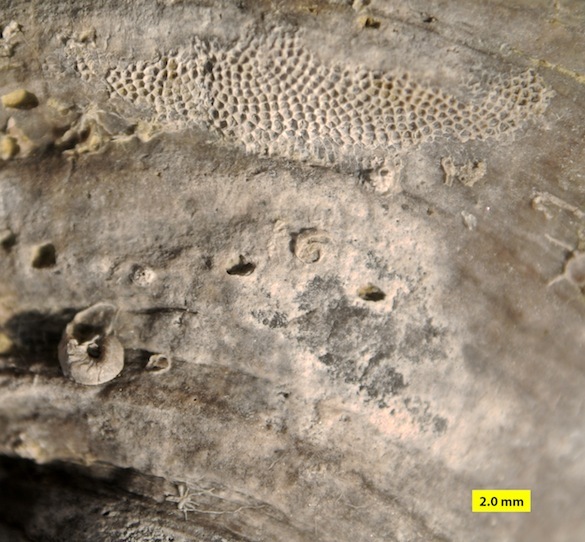 Many of these encrusters are found on eroded parts of the coral skeleton, so they likely encrusted it after death. 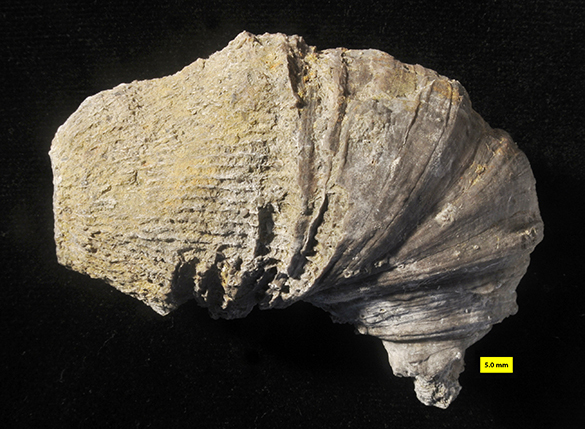 Heliophyllum halli was named by Milne-Edwards and Haime in 1850. We’ve introduced Henri Milne-Edwards (1800-1885) before, and even James Hall (1811–1898) for whom the species is named. Jules Haime (1824-1856) is less known. He died too young at age 32, which may explain why we have no images of him. HIs father was a prominent physician, Auguste Haime (1790-1877). Jules, like many 19th Century paleontologists, started in medicine (studying in Tours) but gravitated toward the excitement in natural history, becoming a zoologist and paleontologist. He specialized in corals, joining up early in his career with Milne-Edwards. Haime rose fast in his new profession. One year before his death he became a professor of natural history at the Lycée Napoléon in Paris. In 1856 he was appointed vice-president of the Société géologique de France, but died a few months later. Milne-Edwards, H. and Haime, J. 1850-1854. A monograph of the British fossil corals. London, Palaeontographical Society. 736 pages.